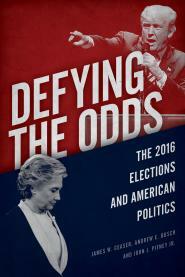 In Defying the Odds, we discuss demographic gaps in the 2016 election -- and ssues such as gun control. Americans are deeply split along demographic lines, but there aren’t many demographic characteristics that embody America’s cultural divide better than gun ownership. In the wake of the mass shooting in Las Vegas on Sunday, the polling firm SurveyMonkey published a pair of maps from its 2016 presidential election exit polls. It showed the electoral maps for voters who said they had a gun in their home, and for those who said they did not. In every state but Vermont – perhaps the most liberal state in the country, but one where many, including Bernie Sanders, support gun rights – voters who reported living in a gun-owning household overwhelmingly backed Donald J. Trump. Over all, gun-owning households (roughly a third in America) backed Mr. Trump by 63 percent to 31 percent, while households without guns backed Mrs. Clinton, 65 percent to 30 percent, according to SurveyMonkey data. No other demographic characteristic created such a consistent geographic split.